Long distance post this Friday, so here’s a page from my Moleskine mapping booklet. 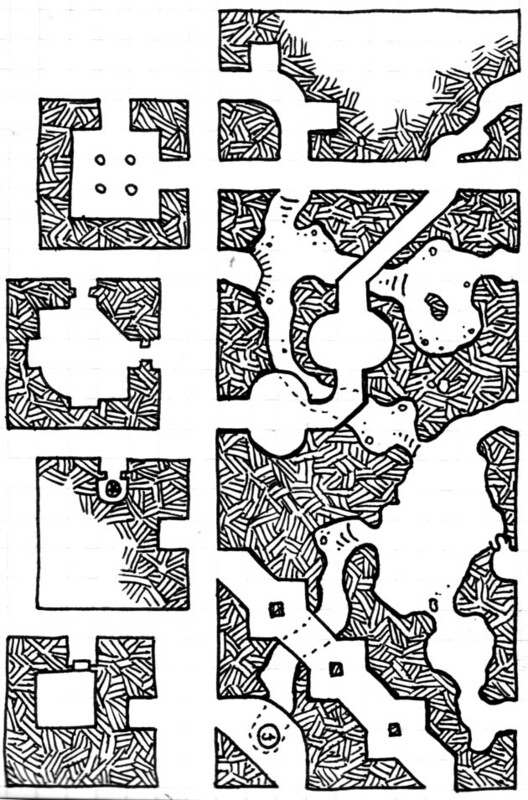 One double geomorph, one end geomorph, and a set of four corner morphs. Dyson I just wanted to drop you a line to say thanks for all the great maps. I can’t stand using adventure modules where you have to flip pages and pages to read the map keys and so I really enjoy the one page dungeon format and modules like your Dyson Delve where each area keyed on one page. I recently got an iPad and I found that converting your maps to PDF and then annotating them in GoodReader is EVEN BETTER. I can just view the map, make annotated keys and then pop open the appropriate notes as I need them. I can even use different colours and symbols. Awesome. Of course I could do this with any map but yours are so nice to look at.